Summary: We all take our smartphones for granted these days, but it wasn’t so long ago that portable phones were roughly the size and weight of a brick (at least it doesn’t seem that long ago to me). It was the genius of Steve Jobs and industrial designer Jony Ive that created the first iPhone. It was a long road to get there, though, beginning with the creation of the Apple company, and continuing with the many machines and software that came before the iPhone: personal computers in a variety of shapes and sizes, the iPod, iTunes, and more. 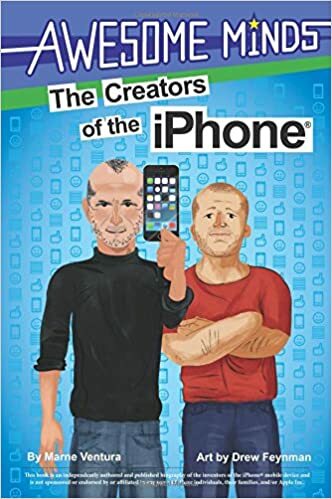 This book takes a brief look at the whole history, starting with the creators’ early lives, and concluding with Steve Jobs’ death and the iPhone today. Includes a glossary, list of books and websites, and index. 56 pages; grades 2-5. Pros: A fast-paced, colorful look at a topic that’s sure to be of interest to kids. The design is appealing, with plenty of sidebars and graphics . Cons: So much material is covered in such a short book that it sometimes seems disjointed and choppy.